Infront Sports & Media already sold media rights to EHF European Handball Championships until 2015 in 13 European countries. Zug, Switzerland / Munich, Germany, 14 April 2009 – ARD and ZDF, Germany’s public broadcasters, have acquired long-term media rights to two editions of the Men’s EHF European Handball Championships between 2011 and 2015 on an exclusive basis. The contract was signed between Infront Sports & Media, the European Handball Federation’s (EHF) exclusive marketing partner for the EHF EURO events and SportA, the sports rights agency of ARD and ZDF. The collaboration between Infront and SportA regarding the EHF EURO events commenced in 2005 and has run successfully since then. 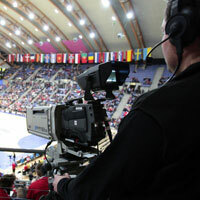 ARD and ZDF also holds the broadcast rights to the upcoming Men’s EHF EURO taking place in Austria from 19-31 January 2010. “Infront is particularly pleased to have extended this broadcast agreement in the largest European handball market. It ensures that the German viewers will have extensive Free-TV coverage of the forthcoming men’s EHF EURO events,” said Stephan Herth, Executive Director Summer Sports, for Infront Sports & Media. The 2008 men’s event, held in January in Norway, had more than 1.2 billion viewers and set a record for a single EHF EURO event. In Germany in particular there was a large increase in interest. Over three times more viewers followed the live transmissions on ARD and ZDF in 2008, in comparison to the 2006 event in Switzerland. The attractive timings of the German matches created a substantial increase of the audience: ARD reached 8.02 million viewers (market share of 32.8 percent) with the live transmission of the semi-final Germany vs. Denmark at 18.00 hours. This was the peak. Denmark (TV2), Norway (TV2) and Sweden (TV4). In Croatia (HRT), Germany (ARD/ZDF), Hungary (MTV), Iceland (RUV), Poland (TVP) and Romania (TVR) the EHF EURO events will be transmitted by public broadcasters. Bulgaria (for the first time in history of the event), Czech Republic, Slovakia and Spain are covered through agency agreements. Infront Sports & Media’s longstanding partnership with the EHF dates back to 1993, when the Swiss-based sports marketing group took over the responsibility for both the media rights distribution and marketing of the European Handball Championship events on a worldwide basis. In June 2007 the EHF and Infront signed an exclusive agreement extending their existing marketing partnership to cover two Men's and two Women's EHF Euro between 2011 and 2015. Infront is now also handling media rights to the qualification matches of the competition.